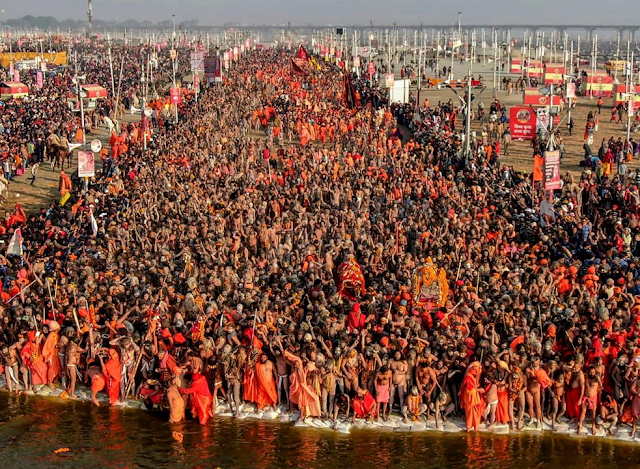 Lakhs of devotees thronged the bathing ghats of Prayagraj Kumbh yesterday, on the occasion of Basant Panchami, the fourth bathing festival of Kumbh. Bathing continued till late in the evening. Third and last shahi Sanam of Akharas was main attraction of the bathing. The Heavy security arrangements were in place for Shahi Sanan to prevent the people from entering the procession area. Mela administration has claimed that that around two crore devotees took holy bath on the occasion. Local residents had set up several free kitchens Lungar in most of the areas in the Prayagraj town to provide refreshment and food to the devotees on the way to Sangam. Akharas will be leaving the Mela area with conclusion of this bathing festival. Next bathing festival of Prayagraj Kumbh of Maghi Purnima will be held on February 19.